Beautiful apartment, cozy, comfortable, close to everything. Enjoy without moving! VISCOELASTIC MATTRESSES RECEIVE OCT POSTS. 2018! Ideally located. Cool in summer due to its north - south orientation. And warm in winter as the sun enters the bedroom through the large sunroom which is a comfortable lounge with sea views. It is on a 11th floor with wide views and is all exterior. Comfortable and cozy to have fun and rest. It has a master bedroom with two single beds, a small room, with a sofa bed, a living room, with one more bed, and the kitchen and bathroom. 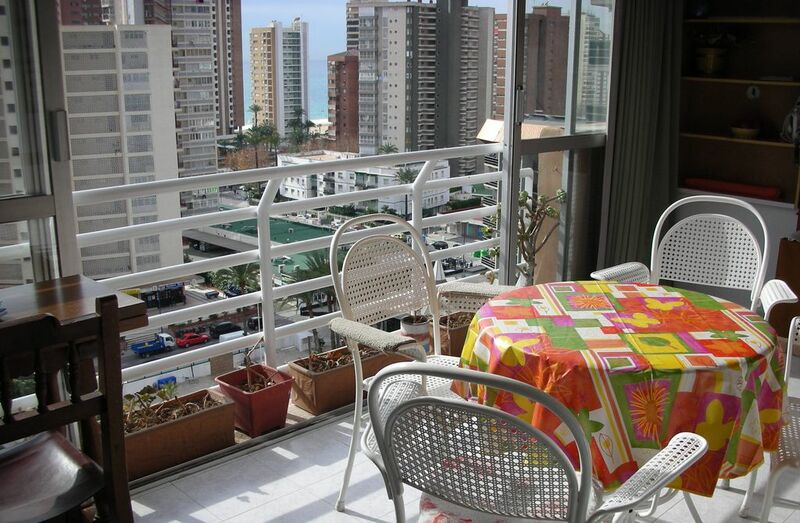 It is located three minutes from the beach walking. In a leisure area, where you have everything for fun and also the convenience of shops, restaurants, supermarkets. All walking and plain. There is not a single staircase. Note: cleaning is not included, so € 30 must be paid upon delivery of the keys. There is Iron, but no ironing board. Please use a table covered with a cloth for ironing if necessary. Shower for convenience. Wide Plate. Vide. Outside. Whatever you need, without hesitation, a qui am. I love acosejar special sites. They are the real holiday to unwind and enjoy the caress of the sun Insured and the best Playa de Espana. the apartment has an excellent hot water system but not a single plug that fits trying to wash up, there is no hairdryer, certain lamps and plug sockets were inoperative and the key system when you leave if before 8 am does not work as the the security doors giving access to the block of the apartments you need the keys which you are supposed to leave in the apartment, so if you do not think, you can lock yourself out of the apartment but remain within the curtlage of the apartment block and have to wait for an early riser or the porter who starts at 8 am. We had a couple of minor problems which I will mention below but overall our stay was great and I would book property again. 10 jours dans se charmant appartement du 30/07 au 08/08/17 en plein quartier très animé. accès a la plage en 5mn a pied. A l'année prochaine sûrement. Je suis très contente de ces locataires . Je les attends toujours . appartement anciens maximum 4 personne car à 5 on est trop, en bas du bâtiment il y a de nombreux bar et discothèque je déconseille de louer au famille c'est plutôt pour des jeunes car la musique ne s’arrête jamais sauf entre 8h et 10h ensuite l'appartement a une odeur de chat un peut dérangent et il fait très chaud. Une semaine avant notre séjours on nous annonces des frais supplémentaire demander bien tout avant votre réservation.Si non benidorm est une magnifique ville avec de belle plage la meilleur plage ce trouve a plus de 15 min de marche.Groupe de jeune je vous conseil cette appartement d'abord il est pas cher et ensuite vous allez trouvez tous les boite en bas de chez vous. There are many pubs and resstaurantes in the area. Guaranteed fun:) is close to everything to rest, the beach side and the great walk along the sea. It is an area of ​​shops to buy, supermarkets, very like everything. There is a market twice a week very close and very interesting where you can find it all at a great price.